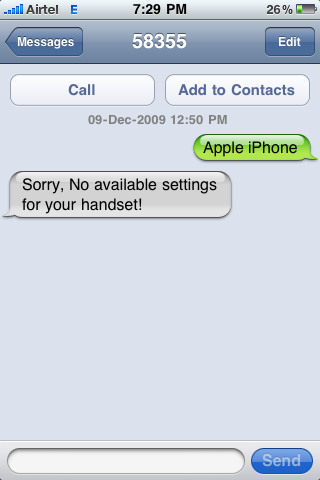 Few days ago I shared a post on how to activate and setup BSNL 3G on your mobile phone, however, if you are using Apple iPhone 3G/3GS then sadly BSNL does not provide you any automated method to configure iPhone specific 3G settings, sending an SMS with iPhone as phone model to receive configuration settings result in the reply below. After lots of tinkering I was able to get BSNL 3G working on my Apple iPhone 3G and surprisingly all it needs is a single APN value to get configured as demonstrated below. To configure BSNL 3G you simply need to enter bsnlnet as APN value by navigating to Settings -> General -> Network -> Cellular Data Network -> APN as shown below. Can't get the GPS to work on my iphone 3G with BSNL... any ideas? Always says Location could not be found! Arnab the iPhone has a aGPS (assisted GPS) unit which means it needs initial assistance from your cellphone towers to get its location first, if this is not working from your current location I would suggest trying this from another location in city and it should work. i am using BSNL data plan with prepaid sim card in my apple i pad . Settings - mobile data options - Mobile data network. Then changed APN in Mobile Data to bsnlnet. Thanks a lot for your post on bsnlnet settings. They worked for me on my iphone 3gs. The help guys did not know anything! @ Krishna Raman: Which geographical area does this work in? as it isnt working in delhi. Sorry for the delay in replying but I am in Chennai. It works well. Although i'm able to activate bsnl 3g sim card in my iphone 3gs but i'm not able to share the 3g internet connection to my laptop. If anyone know how to use iphone as a modem and share the 3g fast internet connection to laptop.Since i have asked many times to bsnl helpline they are not able to answer and some said that the settings for iphone tethering is not yet available. Eagerly waiting for the right answer.Thanks! How did u activate BSNL 3g sim card for iphone 3gs. Its not working for me at all. Your comments will be highly valuable. Please let me know how to connect bsnl 3g to my laptop. Does anyone knows how to get the tv app for iPhone?? Hi, i am using iphone 3g - 16 gb. Took bsnl 3g sim recently. Net works fine in the iphone but it does not come in my laptop. Initially when i was using Vodafone -there used to be an option for "internet tethering" under --> settings --> Network --> internet tethering. it used to work. now after keeping BSNL sim - the option it self is missing. Could you help how do i connect net thorough iphone in my laptop. You have to scroll down the window to see the option. It will come after MMS. I am not able to use vodafon gprs on iphone. ur inputs will be of great help. Pl reply, if possible to harkara@gmail.com. i have a 3G enable Bsnl number but sign of 3G is not appering on my Apple Iphone only the E sign is appering and the browsing speed is very slow. Kinly help me regarding this . Does ESPN works with BSNL 3G in iPhone 3G? I have iphone 3G. I have installed mobiTv from the app store and now i would like to watch ESPN on that. Since BSNL has launched 3G services in pune, i was wondering whether I can watch ESPN on iphone or not? Changing the APN to bsnlnet and post that restarting got me going on my jailbrocken iPhone 3GS (iOS 4.0). What is the APN for Internet Tethering for BSNL/iPhone ? Does anyone know what the correct Internet Tethering APN settings are for iPhone on BSNL 3G? I already have 3G data services working (using 'bsnlnet' for Cellular Data APN), but Internet Tethering does not working with 'bsnlnet' as its APN. I am able to enable tethering and connect to my laptop, but there is no data flowing through (aka no surfing).. Anyone have this issue? Thanks in advance!! bsnl 3g settings for iphone 4? Recently BSNL has launched 3G service in indore but my iphone 3G is not working on 3G network. I have done settings for this. Given APN as bsnlnet in cellular data network. But it doesnt work. when i moved to some nokia phone, the 3G works, it means that the service is activated on my sim. Please let me know if there is any more settings to be done. BSNL 3G Setting Android mobile phones.Just APN Name BSNLNET and connection bsnlnet and remove all other to default. Network mode GSM/WCDMA. Thanks for sharing this setting. I just got Apple iPhone 3G, I am using BSNL pre-paid sim card since many years. I used to get the SMS from BSNL that to activate 3G, type 'ACT 3G' and send it to 53733 (Rs. 21 will be deducted). So, my concern is that, before the setting described here, do I first need to activate the 3G service by sending the above SMS, or just by doing the setting described here, I will be able to use 3G. Worked like charm. I was trying to figure out APN on Vodafone card but you can find APN setting only if you put BSNL card in it. I WANT TO USE 3G BSNL ON MY APPLE IPAD CAN SOME BODY GUIDE ME. I am in Uttar Pradesh. does someone know wat r d settings for my place. I have a jailbroken Apple Iphone 4. How can I activate Net/GPRS along with 3G video calling on APple IPHone 4 with Airtel or BSNL? I am Still unable to find any clues regarding this. After this is done place it in the tray and then switch on ur iPAD after inserting the tray into the iPAD. Now go to Safari and start surfing ..
After this is done place it in the tray and then switch on ur iPAD after inserting the tray into the iPhone. I have iPhone 4 32gb with iOS 4.2 how can I jailbreak it. Tried to do with limer1a but it doesn't do. Any help will be greatly appreciated!! Hey I was running from pillar to pole for activating 3g on my iphone 3gs. Never knew it was so simple. Thanks a lot! how to activate video calling in iphone4 by bsnl 3g? If u cant find APN Settings, get the latest SIM that enough. i need MMS Setting for iphone 4 can any1 help me. i forgot 2 mention "BSNL MMS Setting for iphone "
I m using iPhone 3 gs and bought Bsnl 3 g sim but have VPN not APN plz suggest me how I start 3G setting. I am having a Palm Pre Plus and I want BSNL GPRS Settings for the same, I am from Andhra Pradesh. Please help me in configuring my Palm Pre Plus. can any one help me out please. hi guys, just bought a normal 3g sim card for my iphone 4s, but could not activate 3g service. i had tried with putting apn as bsnlnet, but still edge is working not 3g, do i have to activate some other palns . hey guys...I got an iphone 3g from a friend and i m using it by my old bsnl sim...but in it internet is not working and showing cellular data is not subscribe...what i should do..please anybody help. I have iphone 3g but cellular data is not activated in it.I m using bsnl sim..is 3g sim is compulsory in it? Is BSNL 3G supports personal hotspot function in ipad3, in Airtel it works for me. But in BSNL 3G Network it is not showing that option and Is this network supports for ipad? The above settings are reachable only on lower version of ios. I run ios6.1 and how do i set these APN values? Any help here please? I have iphone 3gs unlocked by the company .When I put the BSNL 2 G sim,it shows NO service.I m using bsnl sim..is 3g sim is compulsory in it? 1). Make sure data services are activated on your device and you see the 3G symbol next to the network name. 3). Now reboot your phone and enter bsnlnet as APN, reboot again and it should work. I took BSNL 3G sim for my iPad 4. It works better in my home town Hyderabad, but when I go roaming to chennai or other place it never connects or works. I am always selecting carrier and restarting my iPad...is there any solution for this to connect or work automatically when roaming. This seems not an issue with your SIM but network reception at the other location. Try it at other places while roaming. thanks a ton for the help. works like a charm. Just restart after entering the settings and vollah!! i use a iphone 5 with R sim. bsnl . there is no option of cellular data settings . hw to make changes in APN as there is no such option available in setting? thx bro u r a gem......! That's nice 3G service. Keep it up! First You got a great Site .I will be interested in more similar topics. i see you got really very useful topics , i will be always checking your blog thanks. Thank you for this article. I had a working 3G connection with bsnl for over an year on my iPhone 4. For some reasons for a few weeks, it stopped working completely. Edge was working though. I thought, something went wrong with the phone, as none of the recommended trouble shooting recommended in the apple official and forum site worked for me. I was thinking on buying another phone, before I hit on this article. This works for me! Great! Just need to set bsnlnet in the APN ..
i hav a iphn3gs32gb with serial num 88935d3v3nr and IMEI num 011948004758188. It could be simply the fact that your roaming location does not have 3G coverage. I did MNP from airtel to BSNL. I enabled 3G as per the instruction given here. (Cellular Data ->APN = bsnlnet) then restarted the phone. Still it is not working. Even I restored the phone twice, does not help. Thank you that was the easiest thing to do! If you see the 3G symbol and browsing is working although with slow speed it means BSNL is not providing proper services in your area. This is a common issue with BSNL at many places, try the BSNL 3G on another mobile in same location to make sure this is not iPhone configuration specific. iPhone 4S, BSNL 3G not working. Hi, I am using iPhone 4S, I got BSNL 3G sim. The display shows "Cellone 3G" network. But I am not able to browse. I called BSNL customer care many times, but they failed to provide me the correct path. I even tried this path "Settings>Cellular>Cellular Data Network>APN=bsnlnet", but still I am not able to browse. Please help me on this. Now its working for me bro, I just had to change the settings (Settings>Cellular>Cellular Data Network>APN=bsnlnet) and a SMS "START" to 1925 as I am a new user for BSNL (I am not sure whether sending SMS will work for other states, I am located in Karnataka, it might change per state, just confirm with the customer care, you need to clearly mention them as a "First Time User" in your conversation with the customer care service rep). This after sending SMS to 1925. It worked for me too. I am from AP. If you are a BSNL new user, you might have to send SMS (START to 1925), it worked for me. I am located in karnataka, not sure whether it will for other states. just confirm with the Customer Service Center as a "new user". I am from TN. SMS "START" to 1925 started working fine....Kudos to the response provided.